First of all congratulations on your decision to start a blog. Creating a blog is the best decision of my life. It is a good option to make side income. It is really real hard work and satisfying at the same time. If you like writing, you will be hooked to it. You will be addicted to it. Blogging opens lot of doors to make money online. 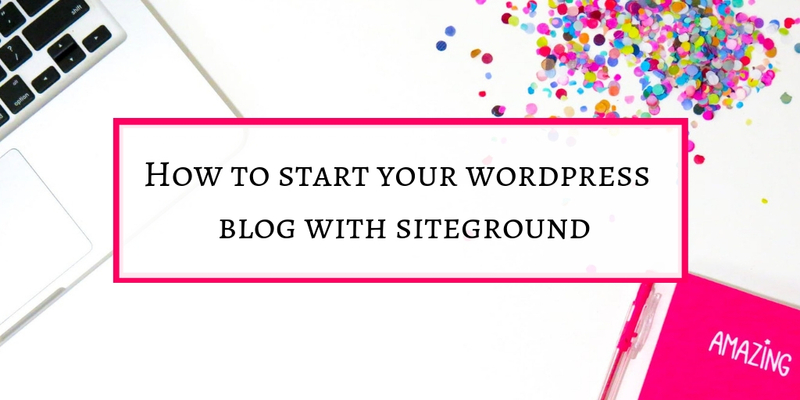 There are few steps you need to take in order to set up your WordPress blog. 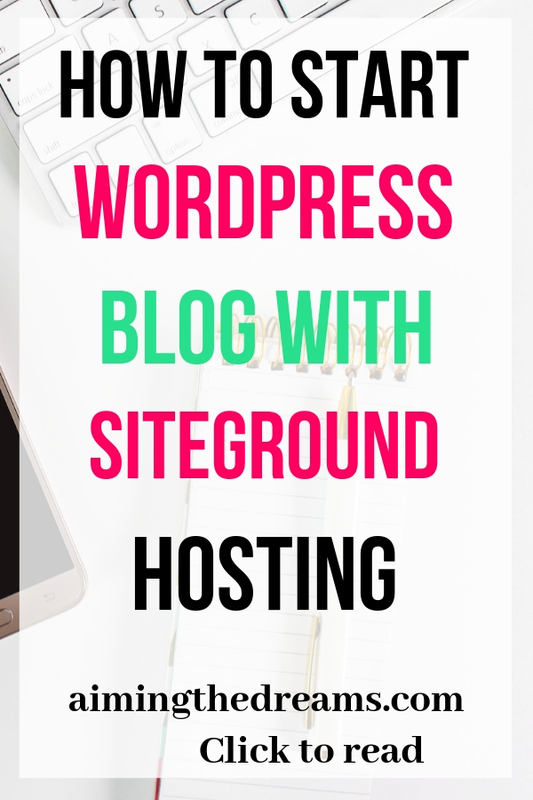 For new bloggers, Siteground is the best hosting company to start with. 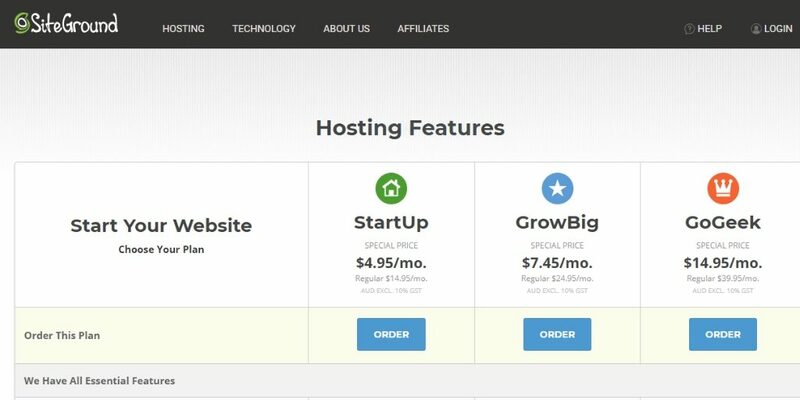 They have very affordable plans for new blogs. 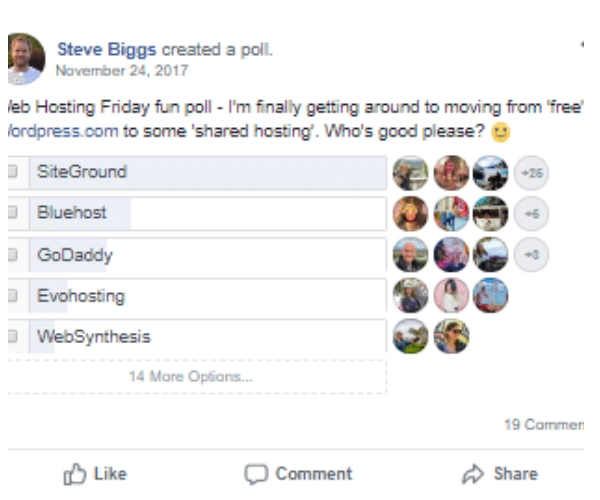 Siteground offers not only good hosting but very good customer support. If you get stuck somewhere, you can easily get the customer support. The best part is you can get phone support too. 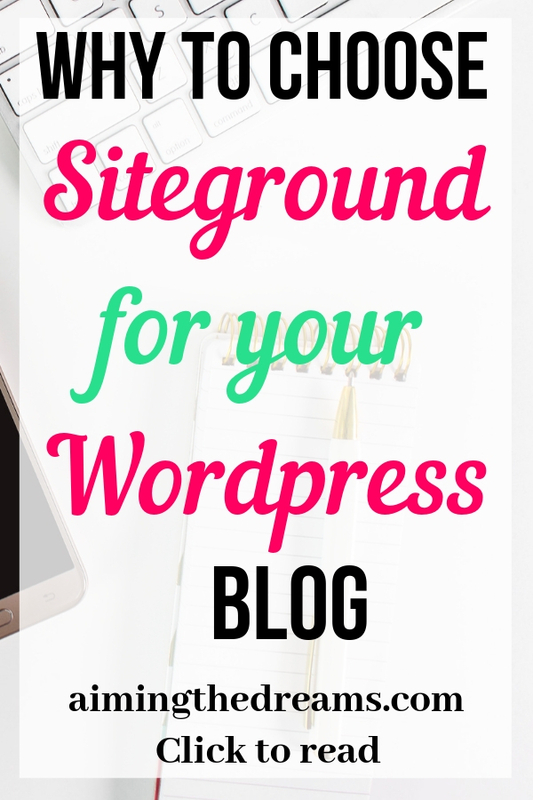 Siteground also help you in installation of your wordpress site. While starting your blog, start up plan is recommended. It is reasonably priced and you will get lot of features which are enough for starting your blog. If you want to upgrade, you can do it anytime. But the start up plan has all the features you need for a new blog and to run a single website. Another very good feature of Siteground is that they provide you phone support which is not very common. And one more very good feature is that they have around five servers around the globe. Speed of your website depends on how much close you are to the host server. If your host is too far from your residence, you will not get a very good speed. But Siteground servers at different parts of the world, make it easy for your website to run fast. Siteteground is considered as a reliable and fast hosting by many people. It is proved in many Facebook polls. Here are few polls which prove this. 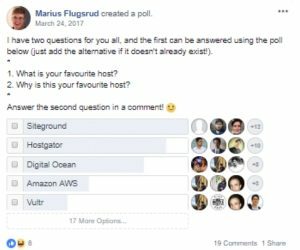 These Facebook polls show that Siteground is considered as one of the best hosting services. 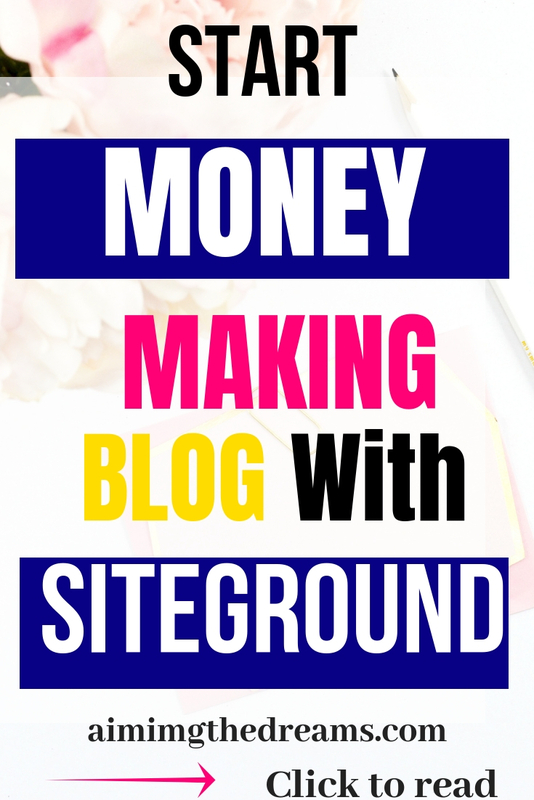 They have plans to suit new as well as seasoned bloggers who have tons of traffic. Brainstorm an idea for your blog. It could be anything and depends upon the topic of your blog. Choosing a good name for your blog is important. There are 3 options for choosing. This one is best when you are starting your blogging journey. This helps in keeping your blogging budget under control along with super professional hosting service. You can upgrade anytime but for the time being this one is perfect. There is a limit that you can start only one website on this plan. And it is good until you have 10,000 visits and you will get 10 GB space. You will require this plan if you get more than 10,000 visits and require more space. This plan includes 20 GB space. If you want to run more than one website, you will need to upgrade to this plan. This plan provides you with premium features. You can have multiple websites with this plan and it is good for 100,000 visits per month. Here you will get 30 GB space. This plan has all the essential features, premium features and Geeky Advanced features. Choose your domain name and sign up for your chosen plan. I recommend using start up plan for now. You can upgrade it as you go on having more traffic and more content on your website. 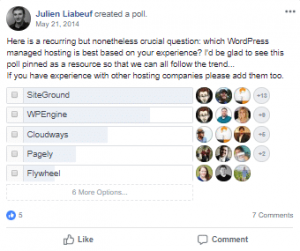 Now that you have paid for the plan, all is done, you are ready to install your WordPress site. Either you can use any professional service or you can do it your self with the help from Siteground. Step 1. Login to your account from Siteground customer area and o to cPanel ( control panel). Step 2. In your my accounts area, access WordPress Installer Icon. Click on it and install WordPress. Step 3. As you have installed now customise your settings. Step 4. Select your protocol. Select “http://www.yourdomain.com”. After this scroll down the page and Customize your site name and Site description. Make sure you change your username and password. Write down these at some secure place. You will need them again. Step 5. Choose admin email. Choose a language. Step 6. Enable Limit login attempts check box. This will let this plugin to get intsalled. It will make your wordpress site more secure. Step 7. Install a theme if you have chosen. Or you may start with default WordPress theme. Step 8. Hit the install button. Now your complete installation and go to admin panel. 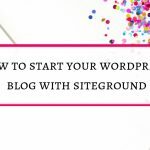 Congratulations on your WordPress installation and you are ready to start writing on your blog. Some successful bloggers say to write down atleast 10 posts before publishing your blog. Start using Canva to make beautiful images. Start your Pinterest business account. It will help you in having some traffic to your blog. Please share this post if you like it. I will appreciate this from bottom of my heart. If you have any questions, you can ask me in comments and if you have any suggestions please share.